Carluke Primrose was founded on 17th September 1938, and we've come a long way since then. The band was formed by a group of local men, mostly miners from the Castlehill Colliery. 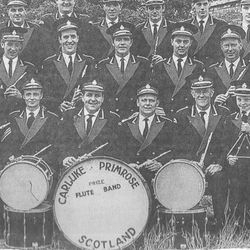 Some founding members had previously played with another local band, Newmains Primrose Flute Band and accordingly it was felt appropriate that the new band be called Carluke Primrose Flute Band. Members saved from their wages, held sales of garden produce and door-to-door collections etc. to raise funds for the first instruments. 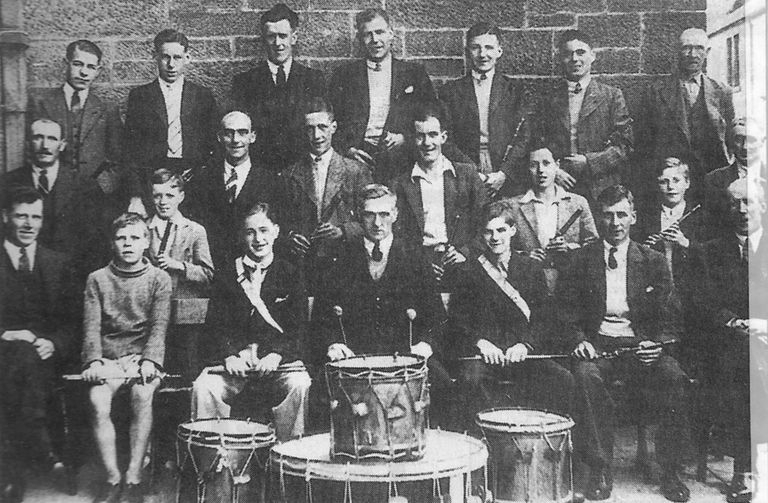 c.1940: This is believed to be one of the earliest photographs of the Carluke Primrose Flute Band from 1940. This was printed in the Carluke Gazette in September 1998. There are a few familiar faces in this photograph printed in the Carluke Gazette in April 2000. Unfortunately we do not know the date it was taken. c.1946-1949: Printed in the Carluke Gazette in April 1997, this photo was found by one of our late Honorary Presidents, Robert Chalmers (Snr.) It is believed to be from around 1946-1949. Scottish Championships 1979: Pictured after the 1979 SAFBA Scottish Championship Contest. Back row L-R: A. Stark, I. Wallace, S. Murdoch, J. Robertson, D. Russell, K. Jackson, A. Callan, D. Frame, G. Barr, T. Bryce. Middle row L-R: J. Bryson, T. Chalmers, R. Chalmers Snr, R. Chalmers Jnr, W. Gisbey Snr, N. Telfer, D. Stark, D. Lang, J. Crosbie, E. Chalmers, J. Weir, D. Bryson. Front row L-R: R. Cossar, B. Chalmers, D. Simpson, J. Smith, H. Crosbie (conductor), B. Horton, S. Young, J. Murphy, R. Barnes. On floor: W. Gisbey Jnr, B. Smith. Thanks to Duncan Brown for photo and naming everyone. New GG Bass: Dougie Russell and John Bryce pictured in February 1995. The value of the flute at the time was £6000 and was the first of its kind. Taken following the Primrose's success in the World Championship Contest in 1997. Arrival of the Contrabass Flute. 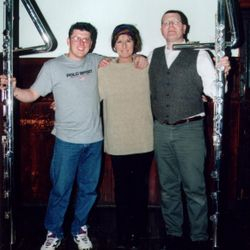 John Bryce and Dougie Russell are pictured with Dutch flute-maker Eva Kingma. Once formed, the band registered in Grade 3 of the Scottish Amateur Flute Band Association (SAFBA). The outbreak of World War 2 in 1939 meant that there was no opportunity to participate in competitions and little time to give concerts. However since most of its members were in reserved occupations, the band held together throughout the war years. By the early part of the 1960's the band had been promoted to Grade 2 and had changed from playing the traditional wooden 'Simple System' flutes to silver flutes although these were still of the simple system design. Further developments took place in 1969 when silver Concert flutes of the modern "Boehm" design were introduced. Other flutes bought at this time include the CC Bass, Treble G, and a number of the Alto instruments. Although the instruments themselves have been replaced, these types of instrument are still crucially important in achieving our sound. In 1971, the band won the Grade 2 Championship playing 'Overture to the Arcadians' and were promoted to Grade 1 where they have remained ever since. In the following 23 years, members' dedication to practice produced a steady improvement in musical quality and brought increased recognition and competition success. 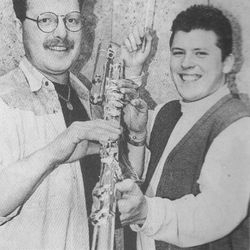 During the years to 1994 the band won no less than eleven competitions organised by the Scottish Amateur Flute Band Association. 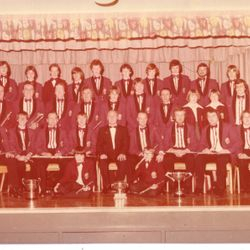 In 1978 they undertook their first visit to Belfast for the North of Ireland Bands Association "World Championship" for Grade 1 flute bands, a visit which was to be repeated on regular occasions over the following years. In early 1994, the band secured the services of a new conductor; John J Bryce ARCM (Perf. ), and entered a new stage of development. A programme for the replacement of ageing instruments was implemented. This would give the band a better range and sound quality. A new rank comprising two GG Bass flutes was quickly introduced to further enhance the band's tone. These instruments were specifically commissioned for the band and were the first of their kind in use within the UK flute band circles. 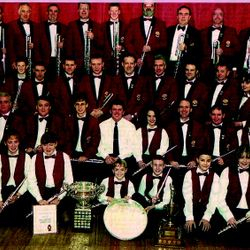 The season of 1997/98, was particularly successful for the band when, in October 1997, the band won the coveted North of Ireland Bands Association (NIBA) World Championship for the first time in their history. 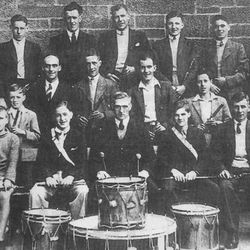 In November of the same year (and with less than half the normal twelve weeks rehearsal time), the band also went on to win the SAFBA Scottish Championship. In November of the same year (and with less than half the normal twelve weeks rehearsal time), the band also went on to win the SAFBA Scottish Championship. The competition season was completed in May of 1998 when the band lifted first prize at the SAFBA Spring Contest. 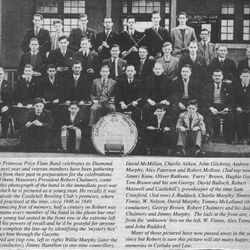 This meant that Carluke Primrose became the first band ever to win all three major contests in the same season. 2004 also became a historic year for the band when they broke the record for the most consecutive Scottish Championship titles. The previous record was set by Motherwell Old Comrades, who held the title for seven years in a row. This meant that Primrose had now won this contest eight years in a row. At the band's AGM in November 2005, it was agreed that the orchestra's name would be 'Carluke Primrose Orchestral Flutes' where it should remain for a while. The new name was created to reflect upon the changes in our music and activities. Even after a change of name, the Flutes continued to reap success at the SAFBA Scottish Championship Contest by continuing to win the Contest year after year - a total of 15 consecutive times until the 2011 contest.